The family practice center in Augusta, called the Family Medicine Institute (FMI), is a long established practice serving about 7,500 patients with approximately 30,000 outpatient visits per year. About six residents in each class practice here, and approximately fifteen physicians, five PA/NPs, and a psychologist make up the clinical faculty based at this site. A clinical social worker and social work case managers are also embedded in the practice. Located at 15 E. Chestnut Street in Augusta, the FMI is a two-story building with 10 patient exam rooms on the first floor and 24 patient exam rooms on the second floor. Each resident is assigned two exam rooms while seeing patients. A procedure suite and a dental room provide additional learning opportunities. Colposcopy, vasectomy, cryosurgery, and other minor surgery are performed at the practice, and residents are also taught how to evaluate dental emergencies and perform extractions. This is an essential skill in a rural state such as Maine, where dental providers are insufficient in number and dental health among the state’s population is poor overall. 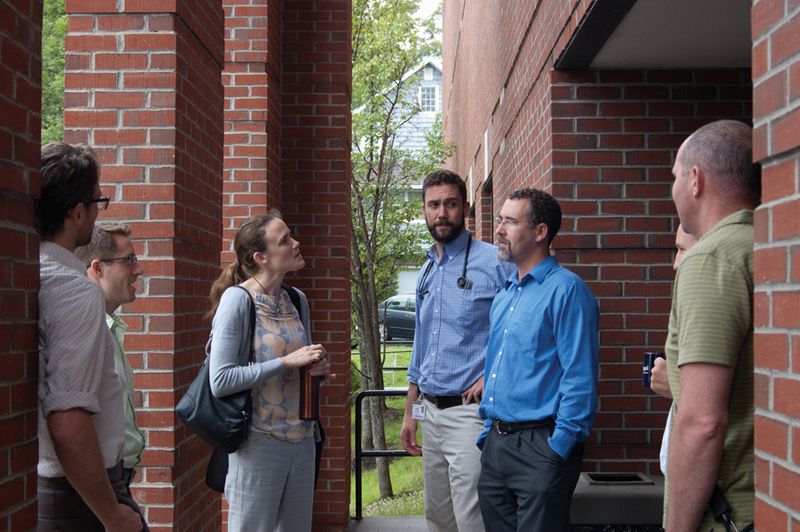 Close, supportive relationships between residents and practice teams are a hallmark of training at the FMI. The facility has a teaching area/library and an area for patient education, as well as a large conference room that connects us to our hospital and other facilities by interactive TV systems. Residents share a large common workspace on the second floor with individual seating areas and computers.